On Friday afternoon, Southwest announced it came to an agreement with Continental to lease 36 slots at Newark. Holy crap. Has hell frozen over? Nah. Just two hours later, Continental and United announced that the Department of Justice (DOJ) has found no antitrust issues with the merger. Ahhhh, I get it. That was easy. I’m talking more about this from the Continental/United perspective at BNET, but here I want to focus on Southwest. An airline that used to consider Islip a New York City airport will now be serving two of the biggest and most congested airports serving New York. Crazy. This slot deal will allow Southwest to have 18 flights in and 18 flights out per day, unless they figure out some magical way to have more departures than arrivals. I’m gonna guess that physics makes that a tough sell. The first flights will begin next March with the full amount of slots going into Southwest’s possession by June. The proposed merger would combine the airlines’ largely complementary networks, which would result in overlap on a limited number of routes where United and Continental offer competing nonstop service. The largest such routes are between United’s hub airports and Continental’s hub at Newark airport, where Continental has a high share of service and where there is limited availability of slots, making entry by other airlines particularly difficult. In other words, Chicago/Midway, Denver, and Houston/Hobby have to be a lock. Baltimore? Probably. (And, as I talk about on BNET today, Continental and United must be happy not to have exact airport competition on these routes.) You could probably fill a schedule with that pretty easily, but there could be other cities as well. Unlike from LaGuardia, Southwest can run Phoenix or Vegas from Newark, if it so chooses. The reality is that with Southwest’s focus on business travelers, Florida might not make as much sense. Sure, you can always fill those airplanes, but with scarce slots, that doesn’t seem like the best plan. Then again, maybe we’ll see Florida at some off-peak times. Southwest has to be thrilled to have benefited from the merger here. Apparently the feds were happy with this deal as well. It may not seem like a huge number of slots, and really, it isn’t. For United and Continental’s nearly 450 flights per day, this is a drop in a bucket. Then again, Southwest does know how to make a drop in the bucket feel like a tidal wave. I’ll bet some other (read: Virgin America) airlines are screaming about this. Why would the feds allow one airline to benefit from this instead of holding an auction for the number of slots they wanted divested, or something along those lines? A great question, of course. Southwest was complaining that the US/DL slot swap wasn’t transparent enough and they wanted an open auction. Apparently that doesn’t apply when they’re the beneficiary. Does this mean that CO will now have to makes cuts at EWR in line with these 36 slots that they no longer have? yes but most of that would likely come from overlapping service that would be rationalized anyway. UA’s three existing EWR-ORD CRJ-700 flights could be replaced w/ one mainline flight (UA also has two mainline flights and CO has four). IAD is another potential slot saver. currently, UA has four ERJ145 flights and CO has six Dash 8-200 flights. these 10 flights could obviously be served by six larger aircraft while still providing plenty of service throughout the day. just these two examples, if my assumptions are accurate, would save 12 slots. i am sure there is more duplicative service that could be rationalized into larger a/c to save slots. You’ll see that there are about 10 flights that leave within an hour of each other that could simply be upgauged to larger aircraft on hub-to-hub routes. The rest I’m sure can be picked from a variety of other small cities if they so chose. With nearly 450 daily flights, this is a drop in the bucket. With all the news that broke on Friday, I was curious to see which item you would tackle first. Safe to say, I think you’ve got plenty of topics to hit on this week. I think UA/CO must have been watching the collapse of the DL/US deal and figured that the easiest way to get this through quickly was to play ball with SWA. I assume you’ll still see the most flights to MDW and BWI. HOU will get a couple. Then probably 1x to LAS and PHX, maybe even LAX. You’re not kidding. There is a ton to talk about this week. Tomorrow, I’m comparing Newark to the slot swap, so that should be an interesting discussions as well. Agreed on the 738, though they will be flying this at least a year before they have the 738s anyway. I imagine places like LGA with even more restrictive slot availability would see the 738 first, then Newark. my guess is the 738s would be great at EWR and LGA; however, i’m not so sure i see WN going transcon from EWR any time soon. first, the utilization of the a/c is so much more limited than running flights to MDW, BNA, BWI, even HOU. second, there is tons of competition AND tons of brand loyalty on these routes. third, WN really pulled back their transcon flying during the oil price spikes and most of it has not returned (esp at BWI, PHL). basically, transcon flying from NYC from WN’s perspective SHOULD BE low prices + long flights + heavy competition + heavy brand loyalty = run away! What about places like MCI or STL? Both are served only by ExpressJet, not mainline CO, and Southwest already has significant operations in both places, allowing for connections to the west coast or other points. If Southwest doesn’t do transcontinental flights, this would seem like a good compromise for connections, and although there would be fewer O/D passengers than say MDW, they would be flying to BWI or PHL pretty much only for connecting flights. i could certainly see that as making sense and you wouldn’t need the -800 on those routes anyway. WN already doing STL to BOS/PHL which definitely fits your model. Well, Phoenix and Vegas are the traditional west coast connecting points, but Denver has rapidly joined that group. Kansas City and St Louis might be possible. I think anything beyond the CO/UA hubs is up in the air. You don’t need the 737-800s for transcon flights. I mean, Southwest flies Baltimore-LA with a 700, for example. The 800 just really brings more capacity, and that’s why I think this is the best place for them. It seems like the 738 particularly makes sense for Southwest if they’re isolating their NYC fleet (both airports) to prevent NYC delays from cascading to the rest of the system. If they are isolating the planes, there’s less reason for the planes to be the 737-700s like the rest of the fleet. I don’t recall; are they (still?) isolating planes flying in and out of LGA? Now how will DL/AA/B6 counter this attach from Southwest at EWR? I think this isn’t much of an attack. Just like when Southwest went to LaGuardia, it effectively creates a spoke for current Southwest flyers. Is Southwest going to take New York by storm with a now combined 26 flights a day between two airports? Nah. hey brett – am i a complete idiot or is there some reason i can’t find the BNET piece you are referring to? You sure do have a chip on your shoulder about Southwest lately, don’t you? First you make their flight attendant union look like a bunch of greedy thugs trying to bully the company into who-knows-what with the possible introduction of the -800 and now this. What I think you failed to mention is that UA/CO is LEASING these slots to Southwest. UA/CO will still OWN them. They are LEASING them to Southwest. That’s a little different than DL/US wanting to PERMANENTLY GIVE AWAY slots at DCA and LGA. UA/CO is not making a gift to WN of the slots. WN is leasing them. I am sure had UA/CO just handed them over to WN free and clear on a permanent basis, there would have been an outcry from other airlines and the DOT would have had an issue. so you are saying that the DOT is more appeased by a temporary leasing arrangement (which, presumably, could be revoked at some point in the future) as opposed to an actual swap? the reverse of your argument would make more sense to me. why would a temporary arrangement be preferable to a permanent one? No chip on my shoulder, just looking at the facts. Southwest said that transparency was the best way to distribute slots and now the airline does a backroom deal. Plain and simple. The slot transfer is through a lease that permanently conveys to Southwest all of Continental’s rights in the assets, in compliance with FAA rules. You can call it whatever you want, but Southwest will now permanently have the assets and it was done through a backroom deal, exactly what the airline said shouldn’t happen in the New York/Washington slot swap. Why haven’t you posted the statements from the other airlines… Poor journalism for you to claim their has been a back door deal with nothing to back it up. How do we know CO/UA didn’t approach other carriers? Eh, I don’t consider Cranky a journalist, I consider him an opinion source.. I just checked Delta and US Airways’s website and it doesn’t look like they’ve issued a press release. I doubt any other airline would disclose that they’ve talked to CO/UA. So do you have a statement from another airline Steve? Or are you just slinging mud for the fun of it? Some folks just enjoy drinking pickle juice, I suppose..
Aren’t journalists entitled to have an opinion? Bias doesn’t immediately exclude a person from being a journalist. A good journalist presents facts, circumstantials and opinion in an easily-read, thoughtful format. Brett’s readership is clearly evidence of how successful he is with this formula. What other comments did he leave out? Or are you just shaking your finger for attention’s sake? Well generally when reporting “news” journalists are supposed to present facts and present multiple sides to an issue. When they start having an opinion it should be consigned to the opinion pages, or be presented as a columnist. E.g. it should be clearly identified as an opinion. Pickle juice is interesting stuff. Although, we once paid a friend in college to drink pickled pepper juice from the dispenser at Steak and Shake…. Sure, but this isn’t the WSJ, LAT, or NYT.. or any circular of that sort. 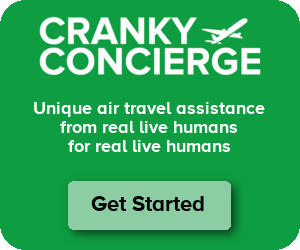 This is CrankyFlier.. a personal blog. Eg. a journalistic columnist. Irrelevant in the end, as Cranky’s blog surpasses many columns in reputable papers.. something that the industry has taken notice of more than once. I don’t think writing an opinion column excludes anyone from being a journalist, but clearly this is an opinion column. If you want breaking news or strict reporting, you’re in the wrong place. And how exactly is this not a backroom deal? There was no open auction process, as Southwest claimed was so important back in the DC proceedings. This was done behind the scenes. Doesn’t matter who approached who. 1) WN has bracketed not only the NY area, but the mitigation of delays impacting the entire system. This is primarily handled through closed-loop setup from (speaking primarily of LGA here) BWI and MDW. EWR will be a different story, as I expect DEN, HOU, MDW and perhaps a Florida hop or two to fly out of EWR. 2) The 738s appear to be SWA’s next answer to airport space/slot restrictions. If the 738s do eventually find service at SWA, I’d expect to see DEN, MDW, and HOU with at least 1 daily out of EWR. You know, Brett (or anyone else willing to undertake this task), a roundup on the slot situation at the high-density airports in the United States would be an excellent article. I didn’t even realize that EWR is now a slot-controlled airport! I assume, DCA, LGA, JFK and ORD are still the only other slot-controlled facilities? And who controls ownership these days? Is Buy-Sell still the predominant regulation that controls these slots? Do airlines still get to use them as assets on their balance sheets? Inquiring minds wanna know! Actually, O’Hare does not have slots anymore. It’s the others you mentioned and then some other strange outliers in different ways. (Like Long Beach, Orange County, etc). I can’t say I fully understand the rules at each airport, other than Long Beach, but something tells me nobody cares about that.